Technically speaking these are not a separate species but because they are so well known under their common name 'Paperwhites' we have listed them separately. They truly are 'Narcissus Tazetta types' as well however the difference is that they are tender bulbs and not hardy in most areas (they will grow outdoors only in the most Southern US states). 'Paperwhites' are extremely popular because of their fragrance and because they are so very easy to grow on just pebbles and water only (soil that is kept evenly and continuously moist will work as well). 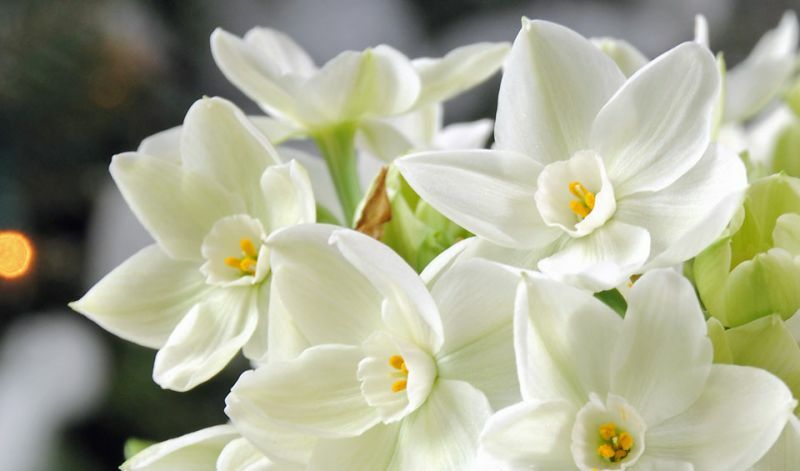 While other bulbs require a 3-4 month cold period, 'Paperwhites' will bloom within 5-6 weeks right in your living room and can be timed to flower during the Christmas holidays. When planted in 2-3 weeks intervals you will have continous flowers all Winter long well into February. HOW TO GROW INDOORS: (1). Select a bowl, dish or container which is at least 3-4" (7-10 cm) deep. (2). Fill the container 3/4 with pebbles (or soil that is kept evenly and continously moist will work as well). (3). Set as many bulbs as you can (it is okay if they touch each other), with the pointed ends up, on top of the pebbles (or the soil) and add a bit more pebbles (or soil) on top to just below the rim of the container but leaving the tips of the bulbs exposed. (4). Fill the container with water until just underneath the bottom of the bulbs (do not let the water touch the bulbs since this may cause them to start rotting) and maintain this level throughout the growing- and blooming-period. (5). Place your container in spot with plenty of indirect light (not direct sunlight) and watch them grow. SOME HINTS AND TIPS: *Bulbs grown in rooms with mild temperatures (60-65F / 16-18C) will grow shorter plants and flower longer, than those grown in warm temperatures. *If you grow them when it is too hot (85F / 29C and higher) it may cause the flowerbuds to dry up. *Planting can be postponed until the end of January: store the bulbs in a dry and cool (but frost-free) place. The crooked sprouts that will develop during storage will stay short and will grow straight immediately after planting. *Later planted bulbs will not grow quite as tall as early planted bulbs. *If you place your early (November) planted containers in a cold (40-50F / 4-10C) spot for 3-4 weeks, your paperwhites will form a better root system and will have a tendency to stay shorter (not as' leggy') as well. 'Ariel' (white), 'Avalanche' (white, yellow cup), 'Chinese Sacred Lily' (white, orange cup), 'Galil' (white), 'Grand Soleil d'Or' (yellow, orange cup), 'Inbal' (large flowering white, minimal fragrance), 'Nir' (large flowering white), 'Yael' (cream, soft yellow cup) and 'Ziva' (pure white).